It's not quite "Where's Waldo," but frequent fliers will be able to catch glimpses of Virgin Atlantic's new Vivienne Westwood-designed uniforms ahead of their official rollout. In a trial run that began Friday, 180 employees, including cabin crew, pilots, Clubhouse staff, and Virgin Holidays personnel, will assess the fit, comfort, breathability, stain-resistance, and performance of the new ensembles before their full launch in 2014. Westwood and her team had to consider a number of practical challenges when tweaking the airline's signature look. 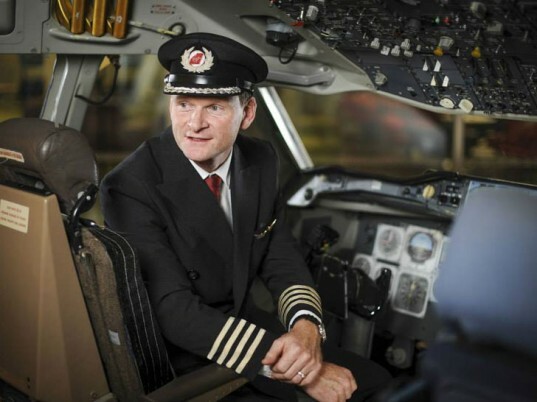 Roughly 7,500 staff wear the Virgin Atlantic uniform while conducting a various job roles, all with differing levels of movement, in different climates around the world. The legendary British designer also developed the new items with sustainability in mind. In addition to the use of recycled materials, the garments are designed to be closed-loop, meaning that that worn uniforms will be reprocessed into fibers for weaving into new clothing. All the garments are designed to be closed-loop, meaning that that worn uniforms will be reprocessed into fibers for weaving into new clothing. For ground staff, Westwood designed bags composed of recycled canvas, reused roadside banners, leather offcuts, and recycled brass. The legendary British designer also developed the new items with sustainability in mind. In addition to the use of recycled materials, the garments are designed to be closed-loop, meaning that that worn uniforms will be reprocessed into fibers for weaving into new clothing. "Our staff, and particularly our cabin crew, are some of the most envied in the airline industry when it comes to uniforms," says Luke Miles, Virgin's head of design, in a statement. The uniforms, Miles adds, have to look sleek while being practical and easy to wear. "It's a challenging design brief but means so much to our staff and customers so we have to make sure we get it right," he says. "We're confident our Vivienne Westwood designs will continue to turn heads in the airport and in the sky."